Some of the rare photos where all 3 of them are in the same picture. !!! Summer is 6 months ++ going to 7 now and she’s like superdog strong. Her size is somewhat in between Hugo (bigger goldie on the left) and Daisy (the black cool mixed spitz) but I think if she charges, she’ll be stronger than Hugo. HEr eyes are getting smaller and smaller AHHAHA and her colour is getting darker, which sometimes can come across as….. dirty if she plays under the rain. Her coat is not as fluffy as Hugo’s, instead more compacted. Haha I know, weird but I think it’s better this way, easy to maintain. Lol. But Hugo looks like a big furry ball, which is good also.. Daisy’s coat is even weirder. She is like half grey and half black. Hahah, like a racoon or something. LOL..
Wokay, back to the fish. Teochew style steamed fish is probably one of my favourite steamed food. I like the whole pickly sour sweet musky broth that comes along with it. Looking at the pic, it’s quite impossible to find the fish in the big pile of other condiments, let alone broth !!! 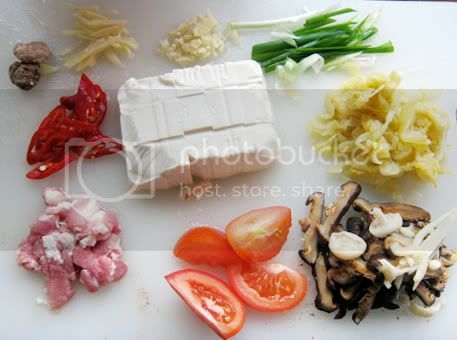 Well, it’s just some of those things where, once u’ve cut them, you might as well use all of it, because its just meaningless to keep half of _______ (insert vege) in the fridge, which could possibly be drier, contaminated, shrunk the next or following days. So sometimes I just whack everything in, regardless. But you may wish to follow the recipe to the dot. I prefer to keep it as a reference. 1. Soak Shitake mushrooms for an hour, remove from water, drain, then slice into thin slices. Wash preserved green mustard and cut to slices too. 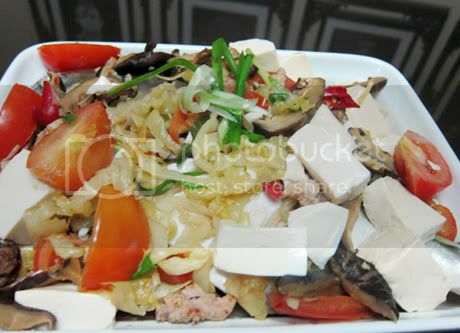 Cut beancurd to cubes and tomato to small wedges. Slice the red chilli. 3. Heat up 1 tbsp of oil and saute chopped garlic until fragrand. Add in ginger, pork, mushroom and stir well. Add in remaining ingredients in Part A. 4. Add in all of the seasoning into pan and bring to boil. Pour mixture over fish and top it off with spring onion. 5. Steam at high heat for 8-10 minutes, depending on size of fish, or until cooked. Remove and served hot. *Fish like pomfret, garoupa, siakap or kurau fish are suitable for teochew style steamed fish. The other thing I like about this teochew steamed fish is …. the preserved mustard green. God knows whats in this preserved little thing. Salty and wacky .. It looks like as if there’s alot of stuffs right, but actually I just use a slightly bigger fish. It’s wide and fat, instead of the normal longish size. I have no idea what fish it was, I do not know my fish, really. On a total unrelated note (wow this post is getting longer and longer), my birthday is this saturday!!! AND, apart of me doesn’t want it to come, because it means I’m getting older 🙁 :(, but am really excited cause I’m going to make a smackingawesomesauce cake. Ok la make it 2, one for my fam, one for my friends. I like making my own birthday cakes, weird ?? I’ve already got 1 fixed, this one from Masterchef (I am seriously totally addicted to the show, any kind aussie wanna send me a copy of their mag for me birthday? HAHA seriously, why am I like that!!!!) and the 2nd one…. Mmm I’m still thinking.. The pork hoh… best is fat ones, fried to a crisp, then use to steam the fish. That will be outrageous!!! Do you really want the magazine? I cans end it to you if you want. I don't wanna disappoint you but I'm a Masterchef freak too. The mag is nothing to shout about. It's compiling all the Masterclass recipes and a lot, I mean a lot of ads on many many pages. There are also a few recipes not within the websites. And it's dirt cheap, just 5 bucks. The postage will prob be more expensive that the mag itself but still if you want it, shoot me an email with your address okay? From me to you! Love you Swee San! 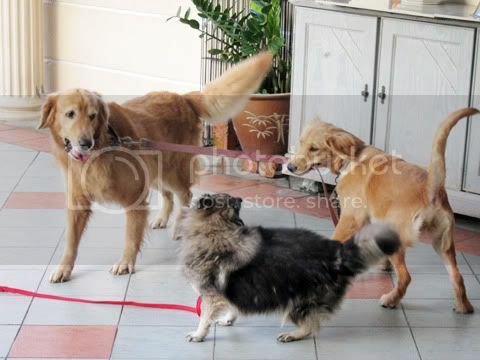 Your dogs are so cute!! 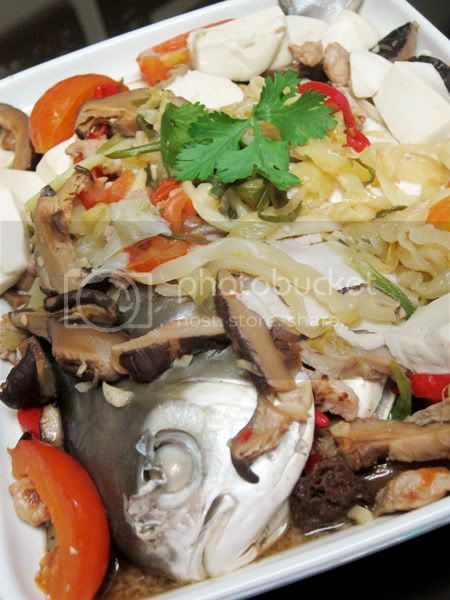 I love this teow chew style steamed fish! Must make soon. I also cooked this fish recently, have yet to post, look like you add more ingredients than me. wow….this is a very simple recipe to follow…nice bloggie here…u r a foodie blogger too? I might actually try this! Thx 4 d recipe. vialentino: em.. yeah ? i can be considered as a food blogger ?